The most wonderful time of the year is upon us and it’s time to usher in the holiday season with restaurant holiday decorations! While the retail industry is often busiest during these times, the holidays prove to be a little challenging for the restaurant business. So adding a few holiday trinkets here and there will not only help set the holiday mood for your business – it could also help boost sales during these months. So, without further ado, we’ve rounded up some holiday decorating tips for the season. 1. Try a minimalist approach. Minimalism is all the fad these days in design – and your annual holiday decor is no exception. There are many ways to go minimalist with your decor. You can go with an all-white scheme, or a combination of just two colors (i.e. gold-red; blue-silver; white-silver; etc), or focus more on a single design element presented in a variety of colors or sizes (i.e. stars, orbs, snow globes, Santa Claus, holiday sweets, etc) scattered throughout your restaurant. 2. Make the most out of your windows. Windows are prime real estate for restaurant holiday decorations. Window decor is, in fact, easily visible from the outside, creating a holiday feel even before your diners can set foot inside your restaurant. Outfit your windows with rope lights, garlands, a row of holiday wreaths, window decals, or holiday-themed drapes to transform plain windows into holiday-ready ones. Use design elements that people would not normally expect for holiday decor. For restaurants, a popular choice would be kitchen utensils and cutlery transformed into trinkets and wall decor. Or, create a tree out of recycled bottles! There are endless possibilities. 4. Incorporate food items in your decor. What would make for more appropriate restaurant holiday decorations than food items themselves? An easy option would be to choose food-themed trinkets for your tree or wreaths. Candy canes and peppermint candies in oversized clear vases displayed on each table or on the bar are also classic and popular choices. You can also use dried citrus slices (oranges, grapefruits, lemons) as trinkets for your tree or wreath – they don’t just look great but can also lend some fresh scents to your restaurant. 5. Freshen up your menu. Incorporate limited holiday-themed dishes items or simply jazz up your menu with holiday designs to usher in the holiday season. 6. Start making an impression right at the door. Add holiday decorations to your entryway! You can go for simple seasonal message mats or garlands on your awnings. You can also add a jolly Santa, snowman, or elf statue to welcome your diners outside your restaurant entrance. Create a jolly and festive mood with holiday-themed restaurant uniforms. You don’t have to go over the top with these as a simple change in your server aprons or the addition of festive hats to your regular server uniforms can easily do the trick. 8. Classic table decor is timeless. When it comes to restaurant holiday decorations, nothing beats classic table decor favorites. This can be as simple as changing up your centerpieces or adding holiday-themed table linens like tablecloths and napkins. The simple addition of bows and/or chair covers in holiday colors/patterns may also work. When it comes to restaurant linens and uniforms for all seasons, get the best quality only from Coast Linen! Coast Linen is your leading source of excellent quality linens designed to meet the needs and demands of the restaurant industry. 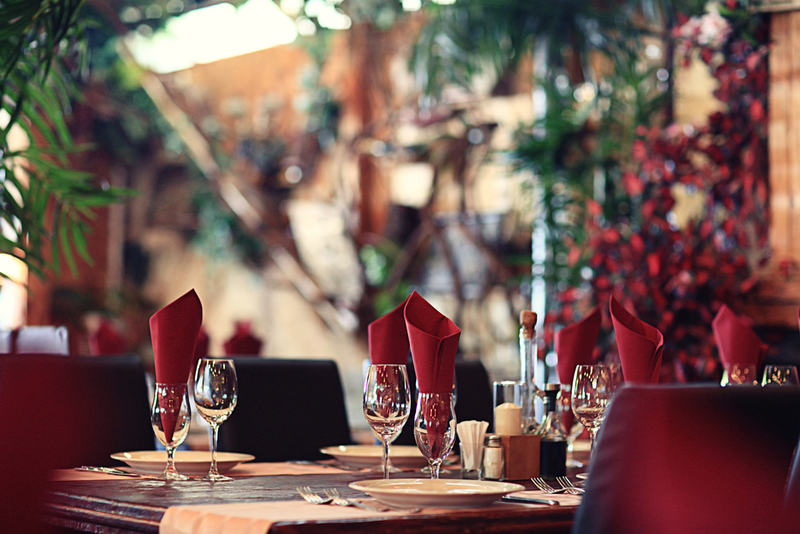 Make those special holiday choices for your restaurant today with Coast Linen! Contact us at 732-775-2000 to place your orders or to learn more about how we can help your business!